Leptin antibody LS-C355514 is an unconjugated rabbit polyclonal antibody to Leptin from human, mouse, bat and other species. Validated for ICC, IHC and WB. Leptin antibody was raised against synthetic peptide corresponding to aa25-44 (QKVQDDTKTLIKTIVTRIND) of mouse Leptin. Percent identity by BLAST analysis: Human, Chimpanzee, Gibbon, Mouse, Bat, Hamster (100%); Gorilla, Rat, Sheep, Bovine, Goat, Panda, Horse, Zebu (95%); Orangutan (90%). The antibody detects leptin from human, mouse, sheep and rat samples. 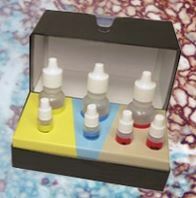 It has been successfully used in Western blot, immunocytochemistry and immunohistochemistry experiments. 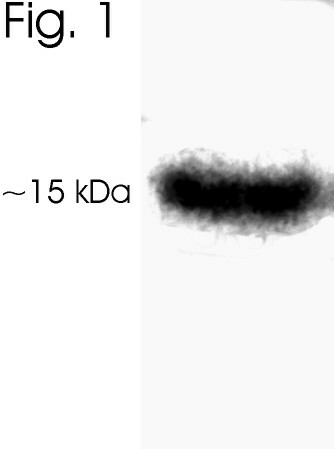 By Western blot, this antibody detects an ~16 kD protein representing leptin from 3T3-L1 cell extract. 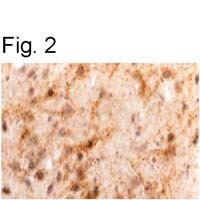 Immunohistochemical staining of leptin in sheep brain with It results in staining of the ventromedial hypothalamus. This sequence is completely conserved between mouse and bovine.